TRAI has also shared Hindi, English and regional languages jingles for mass awareness. Starting January 12th, 2019, Telecom Regulatory Authority of India or TRAI has unleashed a massive SMS marketing campaign for creating awareness. As per reports coming in, TRAI will send millions of SMSes to all cable TV or DTH consumers in India. What will you receive in this SMS? What things should you know? Edit: If you haven’t received the SMS, then please don’t panic. You will shortly receive it. 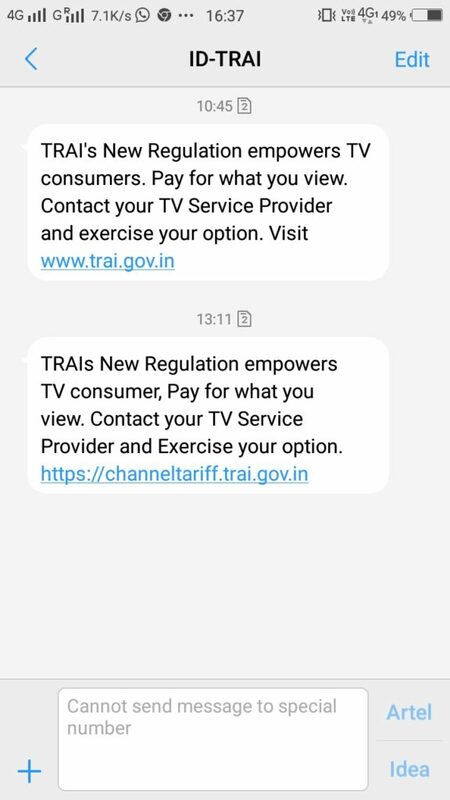 Infact, the same SMS was first sent with the URL: Trai.gov.in and then https://channeltariff.trai.gov.in. When you open this link, then you will find a collection of information, which is meant for the cable TV, DTH consumer. There are jingles as well, which are being broadcasted via TV and radio mediums. This mass awareness campaign was a necessity right now, as the consumers face a daunting task of choosing their channels, amidst hundreds of channels. Confusion is clearly in the air, as some reports claimed that the overall expenditure will now increase, while TRAI is claiming that the expensive will actually come down. Why This SMS Marketing Is Important? The biggest problem in implementing the new TRAI’s Cable TV regulation is: Awareness. How will the DTH provider or Cable operator inform the end-user, about the options which the broadcasters have created, and the options which they have created, bundling the pay-packs, and FTAs? The D2h consumer support executive I talked with, started reciting the channels on the call, and I had to ask him to stop! Not everyone is aware of the websites, and even if millions of users open these portals, they will freeze with an avalanche of traffic. Hence, this SMS based marketing makes sense as of now. The entire bouquet of pay channels, which the operators have provided as of March 3rd, 2019. This will help you to view and choose the ones which you want to watch, and discard the rest. Download it here. MRP or Maximum Retail Price of every pay channel, mentioned in the 1st list. This will help you to gauge and compare the expenses, based on your actual need. Download the list here. The entire list of FTA channel or Free to Air channels, which you will get by default after paying Rs 130 plus GST as Network Connect Fees. Different cable and DTH providers have different FTA lists. Download it here. Suggestive Bouquets of FTA and Pay channels, from TRAI. If you are really confused, then you open this list, and choose the best bundles based on your preferences. This is a nice job by TRAI. Download this list here. It will be interesting to see, how many cable and DTH users are actually benefitted due to this SMS alert campaign, and awareness activity. DTH Activation, Installation Cost Slashed By 58%; TataSky, Airtel, Dish Cannot Charge More Than Rs 500! New Cable TV Rules Postponed Indefinitely By TRAI; No Cable Blackout, No Increase In Cable TV Plans!